$50 Off Your First Full Set of Lashes! A lash flare is a great way to try out lash extensions for the first time! It’s a quick 45 minute service where we apply 30-40 lashes per eye. It can be concentrated on the outer edge to add a little cat eye effect, or spread out across the whole eye. Lashes Make a Great Gift for the Holidays or Birthdays! Available in Dollar Amounts or By Service! Are Lash Extensions Your Best Kept Secret? Time to let the cat out of the bag! Refer a friend to Haute House and get a free fill for yourself! Email addresses provided at the front desk can be opted out of Constant Contact and used for appointment confirmations ONLY. 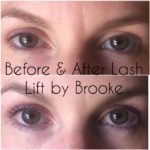 Lash Lift is Here & It’s Amazing!